When Camera Obscura released Salamander's first CD, "Red Ampersand", in 1997 the band was no longer functioning as a unit. However, interest in that release resulted in Salamander reforming. 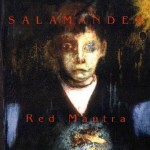 The five tracks on "Red Mantra" consist of three songs recorded between 1994-1996, and two new songs recorded in 1998. Like Skye Klad, Salamander calls Minneapolis its home and its members include Bryce Kastning on drums and keyboards, Doug Morman on bass, Sean Connaughty guitar, acoustic guitar, and vocals, and Erik Wivinus (recently with Skye Klad) on guitar, and Appalachian dulcimer. "Earthborn Animal" and "Old Mister Jones" are the two new tracks. "Earthborn Animal" is apparently a solo number with Connaughty singing a dreamy song while strumming his Appalachian dulcimer. "Old Mister Jones" is a 10 minute track that begins as a vocal number sung to strumming guitars and has a folk-psych feel. Soon the guitar gets a bit more aggressive, a second guitar begins playing airplane engine leads, and wah-wah guitar starts to wail. The song continues as a spaced out psych journey for its duration and is an enjoyable example of guitar mayhem in which different guitar sounds are layered but remain distinct. As the song reaches its climax things get downright molten for an all too brief moment after which the listener is gently placed back on solid ground. From the older tracks, "David's Opening" is similar to Mister Jones though more acidic and with a raw jamming Krautrock feel in parts. I found a few other reviews that compare Salamander to Bardo Pond and while I think in some ways this is accurate I find Salamander offers a more trippy, melt your face off psychedelia than Bardo Pond's wall of noise brand of psych. "Return To Rural Highway" is an easy going exploration that is aptly titled as it conjured up images of a trip across a western desert complete with multi-colored tumbleweeds and glowing cactus. The title track, "Red Mantra", is the band's epic 22-minute mind blowout. The music develops very slowly creating a multitude of cosmic guitar tapestries that again recall a jam rock sound, but retains a dreamy quality. One of the best portions is when drummer Kastning steps to the forefront bashing out tribal beats while the guitars wail away behind him. Listening to this track makes me not only curious as to what more the reformed band will produce, but also anxious to hear what becomes of Salamander guitarist Wivinus' pairing with Skye Klad's Jason Kesselring. As a side note I should mention that the paintings on both Salamander releases are absolutely stunning and done by guitarist Connaughty. For more information, visit the Camera Obscura web site.